Disney’s instant classic Enchanted comes to DVD this week, and we’ve a host of celebratory articles: as well as a review of the disc itself, Jeremie Noyer has been speaking to many of the principal crew for a series of exclusive behind the scenes interviews, including composer Alan Menken, animation director James Baxter and the director of Enchanted himself, Kevin Lima, plus a whole heap of never before seen artwork from the production! • Chapter One: Screenwriter Bill Kelly, the one whose original script started it all! • Chapter Two: Associate Producer Doug Short, championing the project at Disney! • Chapter Three: Musical minstrels Alan Menken and Danny Troob, scoring for a Princess! • Chapter Four: Artists Harald Siepermann and Troy Quane, from development to storyboards! • Chapter Five: James Baxter and Thomas Schelesny, bringing animation and VFX to life! • Chapter Six: Director Kevin Lima and exec producer Chris Chase on their fairytale experience! • Our Animated View: how does the final result enchant on DVD? Review here! 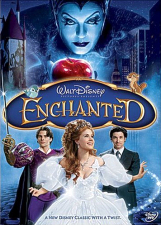 • Enchanted‘s Visual Hertiage: compare the film to Disney’s classics here! • Animated Views’ Enchanted Giveaway – winners’ names announced here!